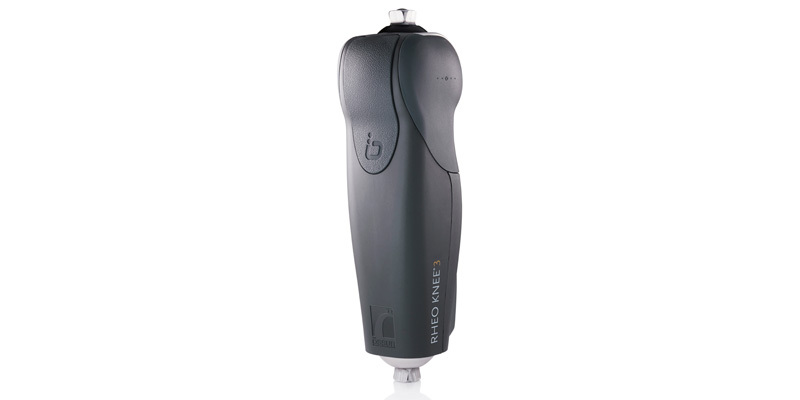 Össur's RHEO KNEE® 3 microprocessor knee aims to provide natural knee function by continuously adapting to the user and environment. Using sophisticated artificial intelligence, it continuously learns and adapts to an amputee's walking style and environment. As a result, it restores the ability to walk naturally, comfortably, and confidently at any speed, even on stairs, ramps, and uneven ground. Its improved toe clearance also means a decreased risk of falling. Actuator and kinematic sensor enhance stance stability and dynamics for more support in stair descent and minimum effort needed in level ground gait. Redesigned extension assist for faster and more natural swing extension. 300 lb. weight limit and up to three days of battery life. Manual extension lock can be engaged to lock the knee in an extended position. Zero lag actuator provides an instant response so it’s easier for high active users to walk their way without focusing on every step. Effortless swing initiation enables a smoother gait. Constant power spring provides natural progression in swing. Five-sensor gait detection, including new gyroscope technology, ensures stability and dynamic response in every situation.